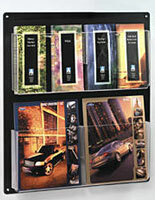 This 4-shelf black 32-pocket magazine display is an interlocking modular fixture that will complement any environment. The stacking design allows each of the freestanding plastic shelves to be used alone or together as a four-tier fixture. Each of the 32-pocket magazine display bins in the literature rack will hold flyers, newspapers, catalogs, sales/marketing materials, periodicals and more. This type of freestanding floor stand is perfect for busy public areas such as lobbies, sales floors, waiting areas and even retail environments. 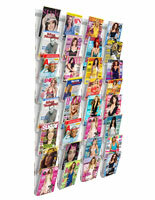 The durable neutral finish 32-pocket magazine display with eight pockets per tier is also a great choice for libraries, school offices and other institutional or educational uses. 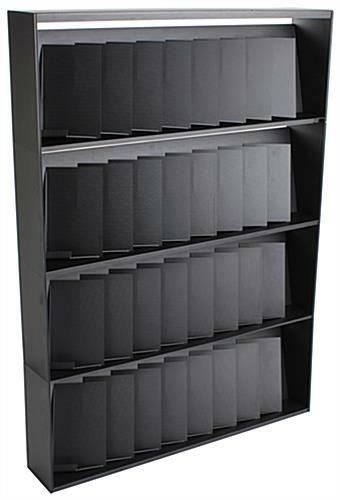 The multi-tier modular literature rack's black finish complements any decor. 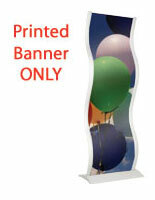 44.0" x 62.3" x 8.6"